This summer Temple was host to the first of two five-week seminars on religious pluralism. Courtesy Dialogue Institute Zhero Anwar of Iraqi Kurdistan adds his signature to the Constitution. 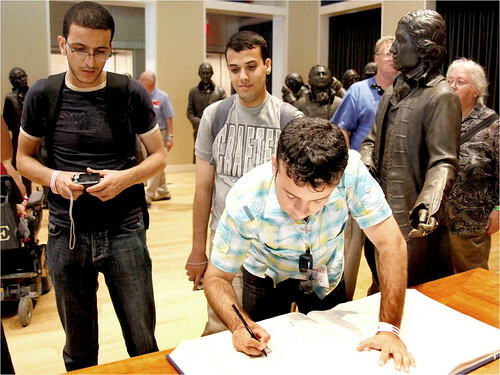 This summer, he was one of 17 Middle Eastern students who attended a seminar on religious pluralism. The Dialogue Institute at Temple, along with the International Center for Contemporary Education, hosted the first of two five-week seminars on religious pluralism from July 3 to Aug. 7. After sending in a proposal a year ago, the U.S. Department of State passed the program, which brought in 17 students from Egypt, Lebanon and Iraq. They spent the first four weeks in Philadelphia and the last week taking study tours. Professor of Catholic Thought and Interreligious Dialogue Dr. Leonard Swidler, the founder and president of the Dialogue Institute, along with Director Dr. Julia Sheetz-Willard, explained the objectives and fundamentals of the seminar. According to the Dialogue Institute’s website, some of the program’s goals include: broadening participants’ knowledge of U.S. democracy and religious freedom, introducing and explaining an array of religious practices and presenting students to the practice of interfaith dialogue. Swidler and Sheetz-Willard agreed that although the students did not always agree with one another, everyone was positive about the experience. During the seminar, the students took a trip to a synagogue in the suburbs where the Rabbi explained Judaism to the students. Hillel, the Foundation for Jewish Campus Life, put together a program with the Dialogue Institute. Hillel is one of the Dialogue Institute’s American Partners, which include eight to 10 undergraduate students from Philadelphia universities, the Muslim Student Association, the Rumi Student Association, the religion club and host families. Phil Nordlinger, the director of Hillel at Temple, said the dialogue was successful. The program consisted of a dinner at which the students from the Middle East shared presentations about their native countries. Afterwards, the Muslim, Jewish and Christian students spoke about religious pluralism and beliefs. Sheetz-Willard said one of the most affected students was a Kurd from Iraq, who had a special tour of the Holocaust Museum in Washington, D.C., one of several travel destinations during the final week. Both Sheetz-Willard and Swidler said this particular student spoke of applying for a scholarship to come back and do research at the Holocaust Institute. They said he also planned to establish a center for dialogue in the Kurdish section of present-day Iraq. Each student was required to develop an action plan related to religious pluralism, that they could employ in their home countries. “We see the movement building,” Sheetz-Willard said. “It’s very exciting to work with these young people because you feel like, yes, in some ways their ideas are already very entrenched, yet they have plenty of time to grow. Swidler, who said he would rate the program a 10.5 out of 10 on a scale of success, said next summer, students from Saudi Arabia will be coming as well.